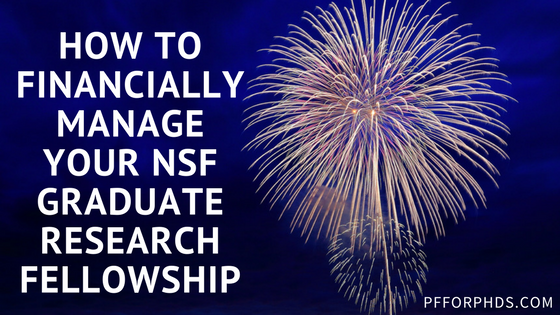 As graduate students, we can be overwhelmed easily by everything our stipends are ‘supposed to’ accomplish for us. If you read any personal finance material (including mine! 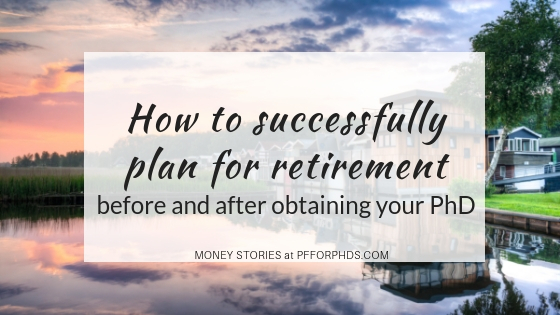 ), you will see that your income should go toward saving for retirement, paying off your debt, saving an emergency fund, saving for your short-term goals… oh, and feeding, clothing, and housing you, too! It can seem impossible to make any financial progress when faced with all these demands. 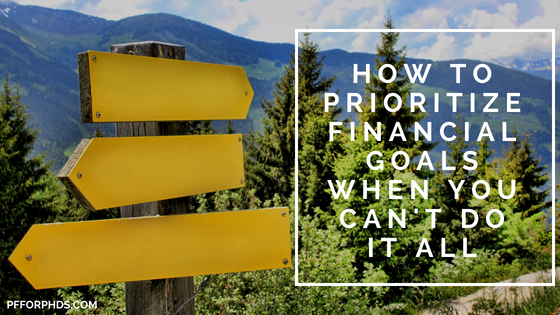 Instead of trying to do everything at once, prioritize the various financial goals you might set based on both the math behind them and your personal disposition toward saving, investing, and debt. In my opinion the first two goals you should accomplish with your stipend are obvious, and after that you’ll have leeway to choose among competing valid goals. The primary purpose your stipend should serve each month is to pay for the basic expenses in your life, such as housing, utilities, food, and transportation. 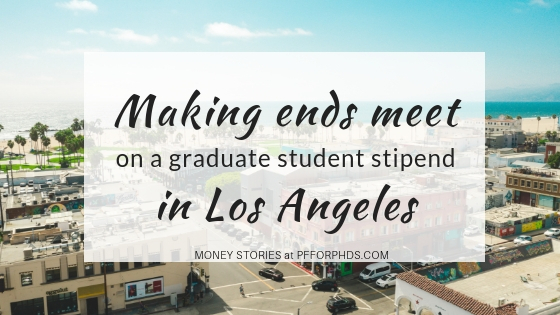 If that’s all your stipend can manage, it has served its purpose: providing you with enough money that you can fully devote yourself to your studies. Increasing your short- and long-term financial security will have to wait until after graduation. However, keep in mind that it’s very possible for these basic expenses to inflate from “need” into “want” territory. “Want” aspects of these basic expenses include living alone, housing amenities (access to pool, gym, social spaces), a car/a car that’s worth a significant fraction of your yearly income, eating out, bar tabs, etc. That’s not to say that you shouldn’t spend money on those above-basic aspects of these expenses, but just be aware that you can’t justify that portion of the spending as “needs.” It’s easy for your large, fixed expenses such as housing and transportation to get away from you, so spending your stipend on the “want” aspects of your basics should be weighed against using it for your other possible financial goals (more on that later). Everyone should have an emergency fund, even if it’s small. An emergency fund is cash reserved only for emergencies. It’s basically money that will prevent you from going into debt when something unexpected happens. A full emergency fund is on the order of 3-6 months of expenses, but that shouldn’t necessarily be your first goal. A small emergency fund of $1,000 is a great start when you have other pressing financial goals, such as debt repayment. It’s not prudent to delay repaying high-interest-rate debt to save a larger emergency fund the purpose of which is to prevent you from going into high-interest-rate debt. Cash savings has great utility. If your expenses are quite uncertain over the next year (such as when you near graduation), it makes sense to save up to be able to pay for the most costly scenario in cash. It’s also a good idea to keep cash on hand for irregular expenses, such as in a system of targeted savings accounts. As just discussed, a larger emergency fund can bring great peace of mind to certain people. But you should limit your cash savings to the amount that you may well need in the short term (1-2 years plus any mid-term goal expenses like a house down payment or wedding). To increase your net worth in the long term and ultimately become financially independent, you need to invest for the long-term and pay off debt. As soon as you have sufficient cash on hand (by your estimation), you should start investing or paying off debt, but deciding when you have enough cash is largely about your comfort level. It’s also fine to simultaneously invest/pay down debt and save additional cash, as long as you can accept that your progress toward each goal will be slower. For example, if you decide to save 20 percent of your income, 10 percent can go toward investing/debt repayment and 10 percent can go toward cash savings. The earlier you get compound interest working in your favor, the better. You can accomplish that by investing or paying off debt. Deciding between investing and debt repayment is again a balance of math and personal disposition. First, do the math. Put numbers on your various possible investing and debt repayment goals. Your debt repayment “rate of return” is the interest rate of the debt in question. The long-term average rate of return on your investments is estimated from your asset allocation. For example, a grad student invested 100 percent in large-capitalization US stocks could anticipate a 9-10 percent long-term average rate of return (before adjusting for inflation). Other asset allocations will have different expected long-term average rates of return. Mid-term investments should be more conservative, with a lower expected average rate of return but more muted peaks and valleys. Second, evaluate your personal disposition. If you feel passionate about one type of goal over another, that should have some influence on your decision. I believe that your passion for a financial goal positively correlates with the amount of effort (i.e., money) you will put toward achieving it. For example, if you hate your debt, you should pay it off, even if the math favors investing. If you are very excited to start investing, perhaps you could reduce the debt repayment handicap in your math to only 1 percent. Just don’t justify keeping high-interest-rate credit card debt because you want to start investing! The one caveat I’ll make to allowing your personal disposition to hold sway over the math is for a very risk-averse person: you will have to start investing eventually, even conservatively, if you want to reach financial independence. You will automatically pay your installment debt off in time even if you just make the minimum payments, whereas there is no mechanism to force you to start investing. So it is acceptable to prioritize (non-mortgage) debt repayment over investing, but when you’re done paying the debt, be sure that you hold yourself accountable to take the next step to start investing. Since our income is limited (unless we have a side income), any money that you put toward the above types of financial goals is money that won’t be used for your everyday comforts and living expenses. By no means do I suggest that you suffer through a Spartan lifestyle while you put every penny possible toward your long-term future. Everything must be in balance for you. A guideline like the Balanced Money Formula may help you work through what percentage of your income to use today and what percentage to put away for tomorrow. When I was in grad school, the financial goal that most excited me was investing. Therefore, after ensuring that I could live within my means and establishing a $1,000 emergency fund, I started investing 10 percent of my gross income into my Roth IRA. Over time, I built up cash savings in my targeted savings accounts and also increased the fraction of my income that I saved for retirement. To devote more money to these goals, I reduced my living expenses by developing frugal practices. Paying off my remaining student loans was my lowest priority as they were subsidized during deferment. I’m happy with these choices given my personal disposition (not risk-averse), but if I were to do it over again I would have beefed up my emergency fund earlier, delaying increasing my investing percentage for a short time. In the last several years, we’ve seen an explosion of “fintech,” aka financial technology. One of those new areas is “microinvesting;” there’s never been a better time to be a beginning investor with only a small amount of cash flow available to invest. No longer must you have thousands of dollars to open an investment account or millions of dollars to receive professional investment advice. While of course it is preferable to invest a large amount of money each month for your retirement or other investing goals, sometimes that’s simply not possible. Often it’s not possible for graduate students and postdocs, yet these groups are just as intensely interested in investing as anyone else – more so, I’d wager. 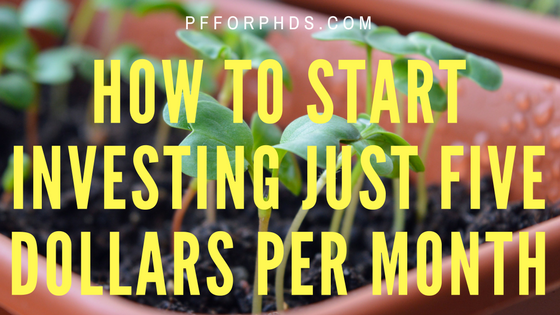 This post details how to start investing with just five dollars per month (or whatever amount of money you can spare right now). Thanks to the power of compound interest, a small amount of money given a long amount of time can turn into a large amount of money. That means that any amount of money you can put away when you are younger is going to make a significant difference to your wealth in retirement. It’s much, much, much better to invest $5/month than $0/month when you have decades to let it grow. Now, you’re not going to fund your entire retirement with just a few dollars per month. 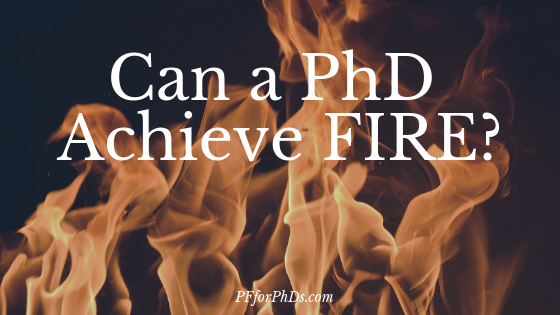 But starting small is perfectly acceptable when your income is suppressed during your PhD training or you are otherwise in a financially challenging circumstance. Get started now with whatever amount you can, and increase your savings rate when your income increases and/or expenses decrease. For example, if you contributed $5/month to an investment account over 5 years and received an 8% average annual rate of return, you’d end that time period with $367. Leave that $367 invested with an 8% rate of return for 50 years, and your ending balance is just shy of $20,000. I won’t sugar-coat it: That amount of money isn’t going to get you too far in your old age. But it is $20k better than taking no action. 1) Committing to an investment plan creates a habit and changes your self-identity. If you invest five dollars per month, you become an “investor.” It’s part of who you are. The positive financial habit of committing to a monthly savings rate is a very powerful one to cultivate early on in life. 2) Once you get started, it’s easy to increase. The biggest hurdle is going from investing $0/month to $5/month, not from $5/month to $100/month. If you self-identify as an investor, you are naturally going to look for ways to increase your rate of investment. When you complete your training and move into a better-paid position, you will be ready and raring to save more each month, and you’ll already have the infrastructure in place. You’ll only be a few clicks away from investing serious money each month instead of having to wrestle with all the decisions and setting everything up at the same time that you’re dealing with a job transition. Until a few years ago, the only way to invest a small amount of money each month and be well-diversified was to use a mutual fund. Unfortunately, to open a brokerage account in which you could buy mutual funds usually took at least $1,000 if not several thousand dollars. Even the brokerage firms that waived their minimum balances usually required an ongoing investment commitment on the order of $50 or $100/month. That barrier can seem prohibitively high to some people; instead of saving up cash for months or years to meet the minimum balance, I imagine many people gave up on the idea of investing. Now, however, several investing platforms use fractional ETF shares to solve this issue. The platform buys whole shares of ETFs but sells fractions to its users. In this way, a user can purchase one or more ETFs in whatever increments she likes, and there is often no minimum balance required to open the account. I reviewed a number of fintech microinvesting platforms for this article, though I do not claim that it is comprehensive. I am not a customer/don’t have a relationship with any of these platforms, so I’ve drawn this information from the company websites and reviews rather than personal experience or communications. Acorns is probably the best-known microinvesting platform. Its concept is to round up each of your purchases to the next whole dollar and invest the change. You can also set up a recurring investment. WiseBanyan calls itself the “first free financial advisor.” (They earn money through upselling products and services to their clients.) The service asks you a few questions and uses Modern Portfolio Theory to construct a passive portfolio appropriate for you. Stash allows the user to choose among low-cost ETFs to create her own portfolio. The expense ratios on the ETFs are low, and Stash can recommend certain “themed” combinations of ETFs. Clink bills itself as more a savings app than an investing app. There is no minimum investment, but if you want to use the scheduler the minimum is $1/day. Clink invests your money in Vanguard ETFs according to Modern Portfolio Theory (a passive strategy). In addition to these companies that are explicitly designed for microinvesting, you could also consider other brokerage firms that have wider array of financial services that includes microinvesting. For example, Betterment is a roboadvisor and has no account size minimums. If you do have a lump sum available to invest, though only $5 per month on an ongoing basis to contribute, you could consider other traditional low-cost brokerage firms like Vanguard, Fidelity, or Charles Schwab (and look around for one that will waive its minimum). What Are the Downsides to Using a Microinvesting Platform? The microinvesting platforms I listed above are providing a great service to a previously underserved population, and they are to be commended for that. But in order to make it possible, they have engaged in several trade-offs that wouldn’t be necessary with larger investment balances. The platforms diversify your money into ETFs, but they offer only a small number of ETFs, and I suspect only a few ultimate combinations of those ETFs depending on the user’s input. This is not necessarily a bad thing. If you simply want a generally appropriate asset allocation and are not too concerned with the exact underlying funds used or the exact percentages, having those limited choices might even be advantageous. But if you want to design your own asset allocation or choose among the other thousands of funds possible, you probably won’t be too happy with these platforms. There are two types of fees typically associated with owning investments. The first is due to the cost owning and transacting the investments themselves. When we are talking about an ETF, this fee is called the expense ratio and is expressed as a percentage of your investment balance. Each of the four platforms above have this fee, and it is typically quite low, approximately 0.1%. If you ever see an expense ratio that is around 1%, this is considered high and a red flag that the fund is actively managed. The second type of fee is for administering the plan or platform itself. For reference, a full-service fee-only human financial advisor charges approximately 1%. Three of the microinvesting platforms in my list above charge at least a $1 per month fee of the second kind. That doesn’t sound like a lot of money in absolute terms, but the whole reason we’re talking about microinvesting is because small amounts of money are worth paying attention to. If you are investing just five dollars per month, a one dollar per month fee is a staggering 20% of your savings rate. This kind of fee absolutely cripples your investing efforts. I would not be at all surprised if you lost money overall almost every year if you were investing just five dollars per month because the long-term average annual return of the stock market is approximately 10%. Of course, you can mitigate this problem by using WiseBanyan or another platform that doesn’t charge a fee (e.g., if you are a student and can have the fee waived) or by investing more money each month. Only one of the above platforms currently offers an IRA investing option to all its users. While it is great to invest outside of an IRA, if you are saving for retirement using an IRA is optimal. Plus, your IRA contribution room disappears every year. If you use a microinvesting platform for a few years as a means to save enough to open an IRA with a larger lump sum, keep in mind that your contribution room disappears with each year. It would be better to contribute to an IRA all along instead of doing it in one lump sum at the end because it would use up so much of your contribution room in the last year. I’m trying to thread a needle here: I want to encourage you to invest any small amount of money you can right now while emphasizing that to reach financial independence or retire someday $5 per month is not nearly a high enough investing rate long-term. If investing just five dollars per month is truly all you can do right now, go for it. But do not allow yourself to think you can keep your savings rate that low when your financial circumstances change. I want you to jump that rate up by about two orders of magnitude as soon as you are able! Doing something is better than doing nothing, but over time you must move from doing something to doing the best thing or the sufficient thing. Further listening: Ask Dave: Micro-Investing Apps? As of now, I do not think that microinvesting platforms are on par with other brokerage firms and investing platforms that require lump sums to open accounts or higher ongoing investment rates. It’s fine to start out investing with a microinvesting platform, depending on your goals, but as soon as you are able, I think you should switch to a brokerage firm that offers a wider array of investments, lower fees, and IRAs. All of the advantages of the microinvesting platforms (aside from the zero minimums) – low-cost ETF investing, asset allocation recommendations – can be found at a brokerage like Vanguard, Fidelity, or Charles Schwab. Plus, start-ups like these fin tech platforms often change their business models or fold, so even if you like your solution right now it might not be around forever. When you do make that switch, be sure to choose a diversified, passive, low-cost strategy appropriate to your goals. And increase your savings rate! If I were in a position to invest only five dollars per month, among the microinvesting platforms I looked at I would sign up for WiseBanyan. Because it doesn’t charge a platform fee on top of the ETF expense ratings and it offers IRAs, I think it gives you the best chance at actually readying you to invest for the long-term. But you also have to consider that it uses a freemium model, which has not yet been proven sustainable in the financial sector.